National Young Farmers Coalition | Vermont Young Farmers Coalition Kicks off 2014 at the NOFA-VT Conference! Vermont Young Farmers Coalition Kicks off 2014 at the NOFA-VT Conference! Heading to the NOFA-VT conference this weekend? 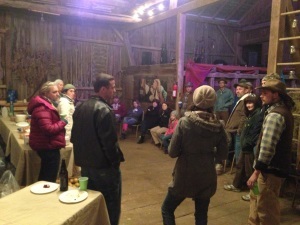 Beginning farmers gathering at the PA Young Farmers Coalition mixer last year. Make sure to join fellow Vermont young and beginning farmers for a workshop on Sunday at 3:45pm by the National Young Farmers Coalition and leaders of the new Vermont Young Farmers Coalition (VYFC). NYFC chapters bring farmers together to learn, share and build community. From co-op buying clubs to crop mobs to meetings with elected officials, NYFC chapters are tackling the barriers we face as young farmers through political action and collaboration. The workshop is an opportunity to learn more about the work of NYFC, what other local chapters are up to across the country, and how to get involved in Vermont. The leaders of the Vermont chapter will share their vision for the group and lead a discussion on how we can unite to build a more supportive community in Vermont. This will be just the first step toward a long-term organization for beginning farmers in the state, so if you can’t make it now, stay tuned for next steps! Not in Vermont but want to organize in your area? Email organizing@youngfarmers.org to find out more.